On Sunday, May 7, the congregation of St. John the Divine Episcopal Church celebrated the 10th anniversary of their ministry with the Rev. Joseph Pickard. As parishioners and guests entered the church, they were given bags of confetti and bottles of bubbles to use during the celebration. These symbols of celebration were used during the service to remember special sermons that had been given during the years that left a mark in the minds and hearts of the members of the church. 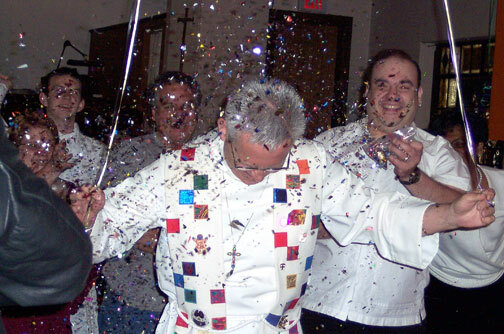 The confetti and bubbles were showered on Fr. Pickard during the sermon in an expression of thanksgiving for the joy and love that Fr. Joe has brought to St. Johns and the Hasbrouck Heights community, where he is also the chaplain to the local Fire Department, since he was installed as the vicar in May of 1996. The sermon was given by members of St. Johns congregation. Carol Haefele, one of the lay leaders of the church, began by sharing an overview of the events of the past 10 years and how the church has grown and explored new areas of ministry. Members of the congregation spoke on his behalf about how he has touched them and about what a good and kind man he is... "when you think of good decent men ...well you think of Joe Pickard because he is a man to emulate and aspire to be like....a man with a heart, a soul, a sense of compassion and a man not afraid to be who he is...gentle, strong and kind." Fr. Joe has touched not only a small church on the corner of Terrace and Jefferson Avenues Hasbrouck Heights, but he has touched individuals throughout the country. Through his love he has touched their hearts and shown them what life is really about; to be yourself and walk in love and to act with kindness towards everyone no matter what walk of life they might be from.... Members shared times that Fr. Joe helped through the joys and sorrows that come in life and how supportive he had been to them and members of their extended families. 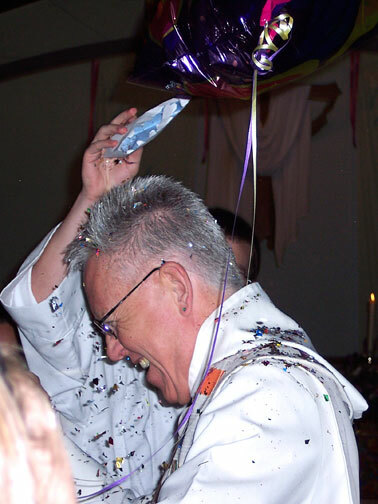 After the sermon the confetti, bubbles, and beach balls were showered on him as he received the gifts from the congregation and the prayers for another successful 10 years of ministry. The relationship between the Rev. 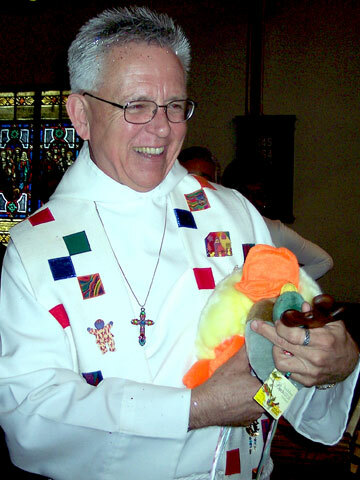 Joe Pickard and The Church of St. John the Divine began as a full time partnership in 1996. Prior to that Fr. Joe shared his time between St. Johns and St. Marys Episcopal Church in Ridgefield Park. When St. Marys decided to end their ministry life, Fr. Joe came to Hasbrouck Heights full-time. He began to work with the congregation to help them realize the gifts and talents that they possessed and how they could use them to help benefit the people in the Hasbrouck Heights community. A group was formed called, "The Challenge." The purpose of this group was to discern a five year growth plan for the ministry life of St. Johns. From the work of the Challenge Committee, Care on The Corner, an outreach ministry of the church was born. Care on The Corner sought to meet the educational, social, cultural and creative needs that continue to be cut out of schools and community life due to state, county and federal aid budget reductions. Programs that have been and continue to be offered include free ESL classes, Kids on the Corner, (a cultural arts workshop), Sophie and Friends, (a toddler social interaction/educational group) Computer Classes, US Citizenship Classes, and other workshops. The response continues to grow with each year. As the outreach ministries began to grow, Fr. 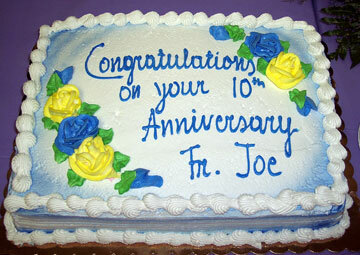 Joe began to encourage the same cooperative spirit in working together to develop worship services for St. Johns. 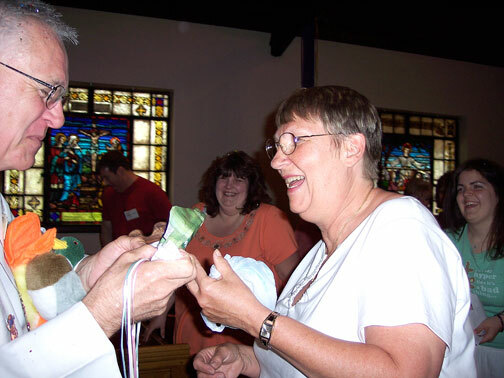 In December of 2005, St. Johns hosted a weekend workshop in Liturgical Arts featuring the teaching of The Rev. Bruce Stewart from the Center for Liturgy and the Arts in Annendale, Virginia. Rev. Stewart taught the congregation different ways to make worship more creative and inclusive, to be able to reach out to many different types of people and to help them feel welcome and accepted in church. From that experience, people at St. Johns have formed worship teams, based upon the church seasons of the year, to help design the worship services and other activities to help enrich the spiritual life of the congregation. The Lenten Team, among other things, did a dramatic presentation of the Good Friday Passion experience. The Easter Team offers experiences that help connect people to the Risen Christ in church worship and their daily lives. Fr. Joe Pickard has brought a sense of joy, creativity, and empowerment to the people of St. Johns in both outreach and personal spirituality. He is a unique man with special gifts and we are blessed to have had him for the past 10 years and we look forward to all the possibilities that the next 10 years have to offer.